Bihar B.Ed Result 2019: Bihar B.Ed CET Entrance Test Distance/Regular Merit List/Cutoff marks is expected to release on end march. As evaluation of Bihar B.Ed CET answer sheet is under processing, we request candidates to have little bit patience till university publishes any official notification regarding the publication of Bihar B.Ed CET result. Nalanda Open University is the university that caters to the conduct of Combined Entrance Test (CET) for B.ed admissions in the state. Latest Update 15th April 2019: Bihar B.Ed CET Result for Distance mode will be available soon. Keep checking this page for more updates. Latest: Result released on 20 March. 2 How to Download Bihar B.Ed. result 2019? Bihar B.Ed CET entrance test for regular mode is going to release most likely on 30th March 2019. NOU has conducted the CET 2019 test for the admission of students to B.Ed program (regular mode) in various universities and affiliated colleges of the Bihar state. Latest Update 23/03/2019: Nalanda Open University has announced Bihar B.Ed Regular/Distance Counselling notification. Registration will be started from 24th March. For more information, follow below link. Bihar B.Ed. CET 2019 exam was conducted offline and it was an OMR sheet based examination. There were 120 multiple choice questions in the question booklet. Question paper was divided into five sections/subjects. This exam was of total 120 marks. Exam was conducted at various examination centers established across the state of Bihar. All the candidates who appeared in the entrance test are now curious to know their result. We are happy to tell them university will announce the result most probably by the end of March 2019. Answer will be published on the official portal of B.Ed. CET on the notified dates. We will also upload all the information regarding the result in this page. Candidates must keep this fact in mind that university do not send any physical or soft copy of result to any candidate through post or any other mode of communication. They have to access their result online as no other mode is applicable. However, candidates will be given an option to print the online result sheet. How to Download Bihar B.Ed. result 2019? Step 1- Visit official web portal of NOU B.Ed. CET 2019 (http://www.biharcetbed.com). Step 2- On the front page of the portal, click on “Click here to View/print Result” link. Step 3- Enter the login credentials such as registration no., date of birth etc. Step 4- Result card will appear on the screen. Step 5- Download and take a printout of the result sheet for future purpose. Once the result will be published online, university will also release the cut-off marks list. Cut off marks will be prepared category-wise. Candidates must meet the cut-off marks criteria to qualify the exam and to eligible for counseling. On the basis of cut-off marks, university will also release the Bihar B.Ed. CET merit list of the successful candidates. Merit list will include the names of the selected candidates who will qualify the combined entrance test. Only those candidates who will have name in the merit list will be able to go to next round of admission. Therefore, it is very important that candidate check their name in the merit list. For the convenience, we will upload there direct link to check the Bihar B.ed admission merit list. After the publication of cut-off marks and merit list board will conduct the counseling. On the basis of cut-off marks, candidates will be selected for counseling. After selection, these candidates have to register for counseling. Counseling dates and official notification will be published later. Candidates will also be notified through web portal, SMS and emails about the conduct of counseling. Seats will be allotted to all the candidates on the basis of their merit in test and choices filled. Seats allotment will be carried on various phases. These candidates have to report the allotted B.Ed. college on the specified dates and have to complete the admission formality. Result is supposed to release on 30th March 2019 on the official portal. No result will be issued in physical form. University will communicate with the candidates through the official website, email, and SMS. Candidates should regularly visit the official university for all the latest updates related to the result. In case of any discrepancy or grievance related to Bihar B.Ed result, you are can contact the University authority. In case you face any problem with the release of Bihar B.Ed. result CET 2019, you can always ask us question in the comment box below. Our expert team will guide in solving it. All the best for result. Councling ka date list Kb Aaeyega jisase pta calega ki kis students ka councling kis date ko hai plz reply sir ? Abhi nhi aaya h. Wait kariye aane hi vala h.
Sir, regular mode ki first seat allotment list kab tak announce ki jaayegi? Good Morning sir, Sir first seat allotment list kab tak aayega ? Aane hi vala h wait Kariye. sir , Iam kumari sindhu singh.mera exam17 march 2019 ko tha. ab tk result nahi mila . kb tk milega.please mera result batayen. Result to aa gya h.
My CET marks is 61..What if I don’t want to take admission in the college alloted? SIR I AM REENA DARLING FROM SASARAM I HAVE OBTAINED MARKS 45 (category EBC) BUT NO ANY COLLEGE ALLOTTED TO ME. SO PLEASE TELL ME FOR SECOND MERIT LIST. If anybody miss his counseling registration and fee payment, than what should he do. Is he not able to get admission or attend counseling. If anybody miss his counseling registration and fee payment, than what should he do. Is he able to attend the counseling or get admission. Plz tell. Sir good morning.seat Allotment ka list avi tk nhi aaya.kb tk aayga sir.or councelling fee vi payment krne ka date 11 se 15 tk hi h.
If anybody miss his counseling registration, than what should he do? Is he not able to get admission or attend counseling. Sir mera graduation part 3 ke marks sheet me mera Nam glt ho gya h.pr Maine name correction ke lie apply kr dia h.bt agr mujhe concealing TK name correction hokr nhi milta hai to kya Mai apna phle Bala marks sheet lekr ja skti hu.mai admission tym apna Sara documents submit kr dungi. Sir, mera no 57 h …me general category mai aati hun…kya mera hoga gov.college mai …. 2nd round me participate kigea. Sir bed mai mera 61 number aaya hai to kya mujhe government college milega. And sir b.ed ka cut off list kab jari kiya jayega. Ane hi vala h kuch der me. Abhi nhi dekh sakte, Seat allotment result aaya nhi h abhi. Seat allotment result aane pe pata chal jaiga. Please illustrate announcement date of CET B.Ed. (Distance Mode)2019. Sir sit allotment kaise pta krnge..
How and when can we check the details of the merit list? Sir 1st counselling list me kitne marks wale ka selection hua h.
Sir Mai general category se hu mera marks 40 hai. Kya Mera admission ho Sakta h.
no , aprox 75 marks govt college k lea. When will B.Ed distance mode result be announced? Start ho gaya h 24th March se hi. Sir,I have got less mark in exam .what I can do for correct Mark’s. Sir mera 52 marks aaya h or me sc me aata hu kya mujhe Government college mil sakta h sir plz reply do. When the cut off marks of Bihar b.ed cet be declared? Sir Mai obc see ur mera 62 marks hai mujhe sarkari college mil sakta hai..
Sir, mera 48 marks hai or mai obc me aati hu, kya mera b.ed government college me ho skta h. Plz reply. Try kigea next round me mil sakta h college. Sir mera 46 marks aaya h or mai obc me aata hu kya mujhe Government college mil sakta h sir plz reply do. I have got less mark in exam but my answer is right showing in the net,what I can do for correct the Mark’s,please give me suggestions. Sir mera 38 marks h.sc category me hu.gowarment college mil sakta h.
We will update it soon. Please wait. Sir mera 57 marks aaya h or mai obc me aata hu kya mujhe Government college mil sakta h sir plz reply do. 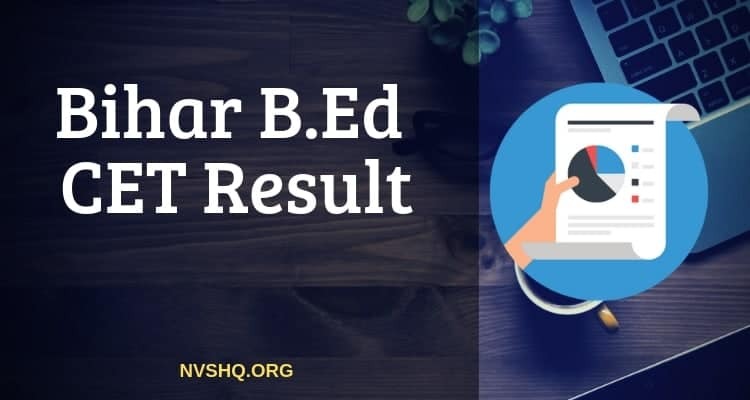 Nou bed 2019 result which released on 20 March…is fake ..
How can we get government b.ed. college..